Graced by the presence of former Montreal Alouettes quarterback Anthony Calvillo, the Stingers entered the 28th annual Shrine Bowl game against the winless McGill Redmen looking to snap a three-game losing skid and get themselves back on the right foot before the playoffs. The Stingers were down for most of their regular season finale, but were saved by the right foot of their kicker, Keegan Treloar, resulting in a 30-28 victory over McGill. Treloar won the game for Concordia with a 45-yard game-winning field goal in the fourth quarter with 27 seconds left to play. “It was a tough kick but I just did my normal routine,” said Treloar. “Getting ‘iced’ by McGill didn’t get into my head as it let me focus and once I hit it, I knew it was good. The Stingers win means the team will end the season with a 5-3 record, finishing fourth in the Réseau du sport étudiant du Quebec standings. 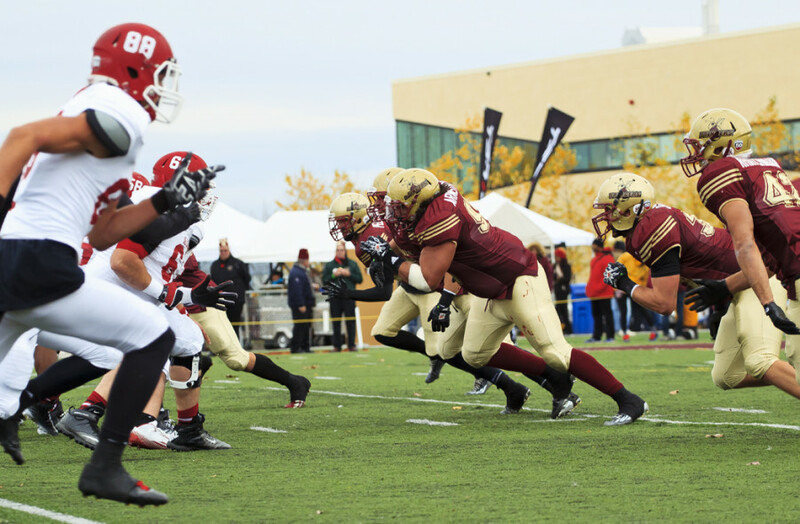 Concordia will meet the Laval Rouge et Or in the RSEQ semi-final playoff game on Saturday, Nov. 8 on the road. The Stingers relied heavily on Treloar to put up points. He scored three field goals on Saturday while the Stingers could only muster one offensive touchdown, with a three-yard run from fullback Olivier Dupont in the second quarter. Despite the return of slotback Jamal Henry from injury, the Stingers’ offence didn’t produce enough points. The Stingers began the game down 8-3 after the first quarter and faced a 13-point deficit in the second quarter before a safety and Dupont’s touchdown made it 18-14 with less than a minute before halftime. 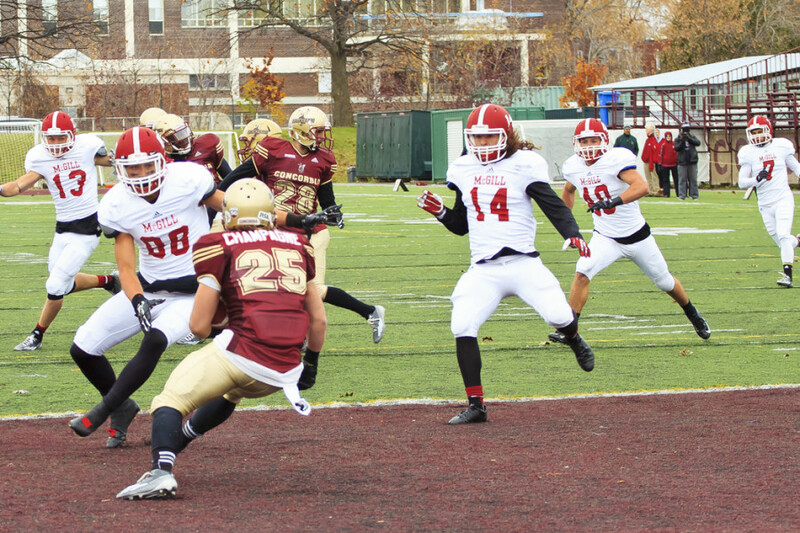 Fortunately for Concordia, on the ensuing kickoff, Stingers first-year halfback Jordan McLaren recovered a loose ball that was fumbled in the end zone by McGill, resulting in a touchdown. Following a rouge kicked by Treloar in the final minute of the second quarter, the Stingers had a 22-18 lead heading into halftime. The Stingers came out of the break and forced two huge interceptions by defensive backs Kris Robertson and Michael Asare that slowed McGill’s momentum, but the Redmen eventually retook the lead thanks to a one-yard touchdown run from quarterback Joel Houle. 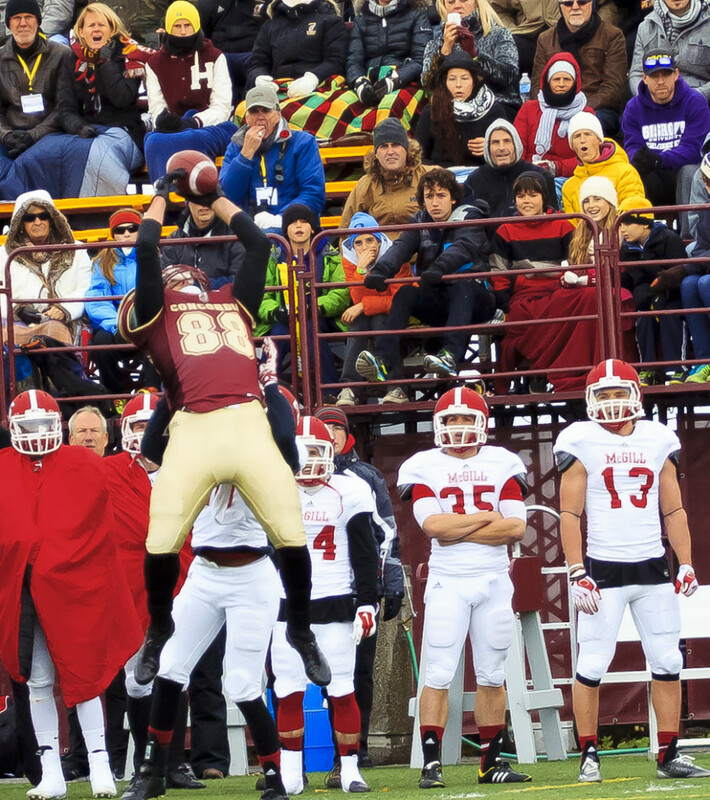 Following a safety, the Stingers were down 28-22 entering the fourth quarter. In the fourth, Treloar hit the second of his three field goals before Concordia forced McGill into giving up a safety, putting the Stingers within one point of the lead. Concordia began their game-winning drive on their own 35-yard line with 2:30 left to play with a balanced rushing and passing attack, before Treloar was called upon to win the game with his 45-yard kick. The Stingers will now turn their attention to their playoff game next Saturday against Laval, a team that lost this past Saturday to the UdeM Carabins 13-9, their first regular season loss since 2012. In the Stingers’ previous meeting against Laval, the Stingers lost 32-16, but held the Rouge et Or to their lowest offensive output of the season at the time. “This game showed we have a lot of character and that we can beat any team, we just have to finish in the red zone and keep believing,” said Dessureault.